Autex Insulation specialise in polyester insulation for both thermal and acoustic applications. Autex Insulation is one of the largest producers of polyester insulation in Australia. Autex Insulation supply a large range of home insulation, commercial insulation and industrial insulation products all over the world. Autex Greenstuf Thermal Polyester Insulation Batts are designed for the thermal insulation of buildings. Autex Greenstuf Thermal Polyester Insulation Batts can be used for ceiling insulation, internal wall insulation, external wall insulation and underfloor insulation. Autex Greenstuf Thermal Polyester Insulation Batts are pre-cut to fit in between ceiling joists, standard timber-framed walls and floor joists. 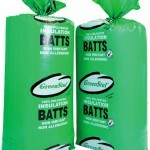 Autex Greenstuf Polyester Insulation Batts are thermally bonded into shape and designed to be self-supporting. Autex Greenstuf Acoustic Polyester Insulation Sound Solution (formerly known as Autex Quietstuf) Batts and Rolls are designed to reduce the transfer of noise in buildings. Autex Greenstuf Sound Solution products come as pre-cut acoustic insulation batts and rolls to fit in between standard wall framing and the joist spacing of the mid-floor sections. Autex Greenstuf Underfloor Polyester Insulation Rolls are designed to provide thermal insulation under floors. Used where joist are exposed in both new and existing, timber buildings. Autex Greenstuf Underfloor Polyester Insulation reduces heat loss through the floor surface and helps reduce drafts through the floor. Autex Greenstuf Underfloor Polyester Insulation Rolls are pre-cut to fit standard timber joist floors. They are easy to install just by stapling the rolls into place between the floor joists. 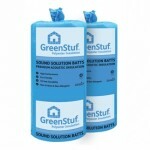 Autex Greenstuf Acoustic Sound Blanket (Autex ASB) is made of polyester insulation. Autex Greenstuf Acoustic Sound Blanket is designed for a variety of commercial building applications. These include wall insulation, wall partition insulation and they can also be used as ceiling overlay insulation. The Autex Greenstuf Acoustic Sound Blanket (Autex ASB) is used to reduce resonance in Plasterboard wall systems, improving internal sound. Autex BaffleBlock Sound Control Polyester Insulation is a simple but effective sound control system. Autex BaffleBlock Sound Control Polyester Insulation is used for both existing and new commercial buildings. Autex BaffleBlock Sound Control Polyester Insulation is stacked on top of partition walls in order to reduce any sound transmission through the ceiling cavity. Autex BaffleBlock Sound Control Polyester Insulation is simple to install and will mould itself around any ducting or other services. Autex BaffleBlock Sound Control Polyester Insulation is pre-cut into rolls to fit standard widths. Autex Acoustic Absorption Blanket (Autex AAB) is made of polyester insulation. It is designed to reduce and control reverberating noise inside a building. Autex AAB is suits a variety of industrial and commercial building applications. Autex AAB can be custom made to a variety of densities and thicknesses.